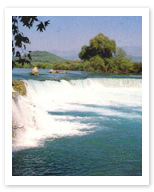 The Manavgat River, which springs from deep within the imposing Taurus Mountains, is at the center of the Turkish government’s plans to export desperately-needed water to the Middle East. The town that shares its name with the river is best known, however, for its Monday Market, and for the waterfalls which are the heart of its small but burgeoning tourist industry. These horseshoe-shaped falls are reachable by boat, about 4 kilometers upstream, and nearby are plenty of places for you to grab a meal, a snack or some tea before taking a few pictures, relaxing and heading back down the river.